Klik på billedet og se alle billeder fra Villa Filip. WiFi tilgængeligt på alle områder, Golfbane (indenfor 3 km), Lystfiskeri, Skiløb, Dart, Vandring, Cykling, Ridning, Restaurant, Grillfaciliteter, Snackbar, Sauna, Massage, Spabad, Lufthavnstransport, Cykeludlejning, Lufthavnstransport (mod tillægsgebyr), Have, Terrasse, Kapel/helligdom, Solterrasse, Fælles køkken, Fælles opholdsrum/TV-område, Ikkeryger-værelser, Familieværelser, Varme. 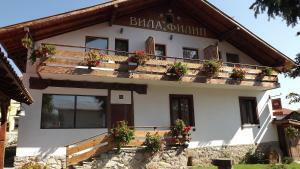 Beautifully located between the Rila, Pirin and Rhodope Mountains in Bachevo, only 8 km from the ski resort Bansko, Villa Filip offers individually decorated accommodation. The rooms are individually designed and have private modern bathrooms, satellite TV and free Internet access. The tavern of Villa Filip is in the basement and it has an amazing, local style with stone masonry and a handmade coppery dome over the fireplace. It seats up to 50 people. Traditional dishes and specialties are served. The Villa also has a summer garden with a barbecue place. Villa Filip is an ideal starting point for various hiking. There are 3 horse bases above the village , remains of Roman settlement in the area Perivol, Dzherdzheva rock chapel "St. George", healing mineral springs in the Banishte area. Picnic by the river, snowmobiles, mountain biking are also available to the guests.